Work-In-Progess talk from EuroTcl 2016. - None for building Tcl/Tk, TEA compliant packages or Tclkits. - Otherwise Visual Studio or Visual Studio Express. Versions 2008, 2010, 2012, 2013, 2015, 2017 are currently supported. If Visual Studio is not installed in the standard location, you have to adapt procedure GetVcvarsProg in file Bawt.tcl. 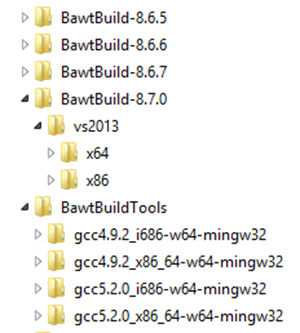 - Extract BAWT-Framework Bawt-0.9.1.zip in a folder of choice. Start the BAWT automatic library build process. in the setup file are built. by option "--list" or specify a range of numbers (e.g: 2-5). Note, that at least either a list or build action option must be specified. --help          : Print this help message and exit. --version       : Print version number and exit. --procs         : Print all available procedures and exit. --proc <string> : Print documentation of specified procedure and exit. --loglevel <int>: Specify log message verbosity. Choices: 0 - 4. Default: 3. --nologtime     : Do not write time strings with log messages. --list          : Print all available library names and versions and exit. --platforms     : Additionally print supported platforms. --wincompilers  : Additionally print supported Windows compilers. --dependencies  : Additionally print library dependencies. --authors       : Additionally print script authors. --homepages     : Additionally print library homepages. --clean     : Clean library specific build and install directories. --extract   : Extract library source from a ZIP file or a directory. --configure : Perform the configure stage of the build process. --compile   : Perform the compile stage of the build process. --distribute: Perform the distribution stage of the build process. --finalize  : Generate environment file and call user supplied Finalize procedure. clean, extract, configure, compile, distribute, finalize. --update    : Perform necessary stages depending on modification times. Note: Global stage finalize is always executed. --simulate  : Simulate update action without actually building libraries. --touch     : Set modification times of library build directories to current time. --architecture <string>: Build for specified processor architecture. --compiler <string>    : Build with specified compiler version. Using gcc: Windows Linux Darwin. Using Visual Studio: vs2008 vs2010 vs2012 vs2013 vs2015 vs2017. --gccversion <string>  : Build with specified MinGW gcc version. Windows only. --tclversion <string>  : Build Tcl, Tk and Tclkit for specified version. Choices: 8.6.6 8.6.7 8.6.8 8.6.9 8.7.0. --osgversion <string>  : Build OpenSceneGraph for specified version. --buildtype <string>   : Use specified build type. Default: Specified in setup file. if supported by build script. --exclude <string>     : Force exclusion of build for specified library name. --url <string>         : Specify BAWT download server. --toolsdir <string>    : Specify directory containing MSys/MinGW. --builddir <string>    : Specify build root directory. --libdir <string>      : Specify directory containing library source and build files. --distdir <string>     : Specify distribution root directory. --finalizefile <string>: Specify file with user supplied Finalize procedure. --sort <string>        : Sort libraries according to specified sorting mode. --noversion            : Do not use version number for Tcl package directories. Default: Library name and version number. --noexit               : Do not exit build process after fatal error, but try to continue. Default: Exit build process after a fatal error. --noimportlibs         : Do not create import libraries on Windows. Default: Create import libraries. Needs Visual Studio. --noruntimelibs        : Do not copy VisualStudio runtime libraries. Default: Copy runtime libraries. Needs Visual Studio. --nostrip              : Do not strip libraries in distribution directory. --noonline             : Do not check or download from online repository. --norecursive          : Do not check recursive dependencies. --nosubdirs            : Do not create compiler and architecture sub directories. Default: Create compiler and architecture sub directories. --iconfile <string>    : Use specified icon file for tclkits and starpacks. Default: Standard tclkit icon. Windows only. --resourcefile <string>: Use specified resource file for tclkits and starpacks. Default: Standard tclkit resource file. Windows only. --numjobs <int>        : Number of parallel compile jobs. --timeout <float>      : Number of seconds to try renaming or deleting directories. --copt <lib> <string>  : Specify library specific configuration option. This section contains example batch scripts to generate the Tcl-BI distributions and to test the BAWT libraries with different Visual Studio versions. The following batch scripts can be used to create the Tcl-BI distributions for all supported Tcl versions. 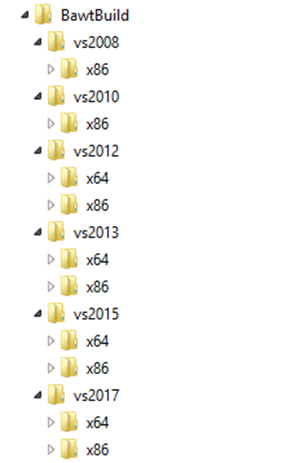 A separate directory (BawtBuild-X.Y.Z) is created for each Tcl version containing both the x86 and x64 versions. The needed MSYS/MinGW versions are located in directory BawtBuildTools (using option --toolsdir) to avoid extracting these for each Tcl version. Note:You may need to adapt the pathes specified in BUILDLDIR and TOOLSDIR as well as the used Visual Studio version specified in VSVERS. rem If no target is given, use target "all". rem Loop through the rest of the parameter list for targets. rem There is a trailing space in the next line. It's there for formatting. rem Build all libraries as listed in build configuration file. The following batch scripts can be used to build all BAWT libraries with different Visual Studio versions. The different versions are created in directory BawtBuild containing both the x86 and x64 versions. Note:You may need to adapt the pathes specified in BUILDLDIR and TOOLSDIR as well as the used Tcl version specified in TCLVERS.